All models are now available from Vintage King. Duh Remedial Fuzz. In stock now at Vintage King! Filth Fuzz. In stock now at Vintage King! Gross Distortion. In stock now at Vintage King! Cult Germanium Overdrive. In stock now at Vintage King! Cult Germanium Channel. In stock now at Vintage King. Screech Octave Fuzz. In stock now at Vintage King! More info. Porkolator Distortion. In stock now at Vintage King! More info. Purr Vibrato. In stock now at Vintage King. I’m Joe Gore, and I’m obsessed with stompboxes whose tones change according to touch, technique, and guitar settings. Yes, some players prefer effects that compress and smooth their sound for more consistent and predictable results. That’s cool, but I’d rather expand the guitar’s dynamic range. Circuits from the 1960s and ’70s are often my jumping-off points, but I usually jump pretty far. No clones here. Example: As a single-germanium-transistor overdrive, Cult Germanium Overdrive has roots in the geranium boosters of the 1960s, though the apple has rolled far from the tree. The tone curve suits everything from a sizzling Tele bridge pickup to a woolly neck humbucker. The gain control operates in a novel way, so that every knob position yields usable sounds. 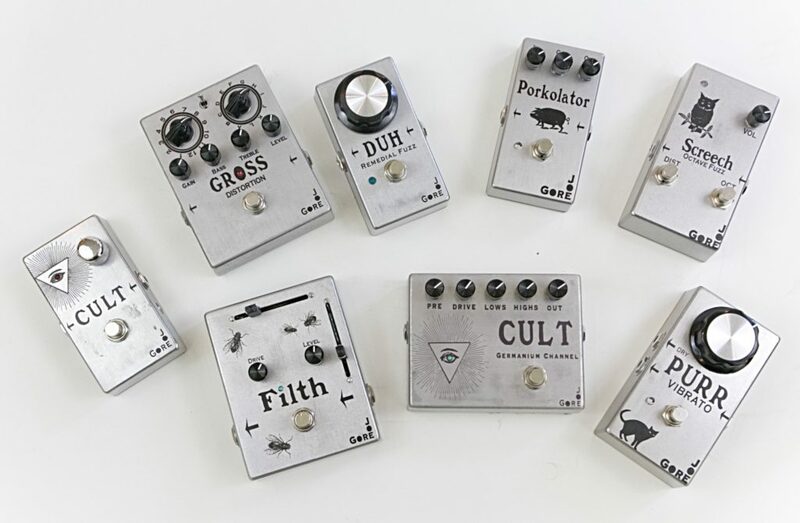 And while you expect germanium overdrives to clean up when you roll off guitar volume, Cult takes the phenomenon to extremes: The rolled-back tone is nearly identical to bypass. You can literally leave Cult on all night and go from crystal to sludge by touch and guitar settings alone. Other products aren’t so minimal. Filth Fuzz and Gross Distortion are wide-ranging “tone factories” for studio sound sculpting, but they still provide crackling presence and hair-trigger dynamic response. My pedals aren’t for everybody. Guitarists who focus on dynamic variation and touch sensitivity will probably dig them most. They’re designed in San Francisco and manufactured in Michigan by skilled craftspeople earning a fair wage. They’re available from Vintage King. Joe Gore is a musician, writer, and music-tech geek. Joe has performed with Tom Waits, PJ Harvey, Tracy Chapman, Marianne Faithfull, Courtney Love, Flea, Les Claypool, and many other artists. He’s written literally thousands of musician interviews and gear reviews for the leading musician magazines, and he helps develop music products for various manufacturers (notably Apple, where he’s been a major contributor to Logic Pro and GarageBand software). He also runs tonefiend.com, a geeky guitar blog.